Our annual Lower Flint River Paddle is one of our most anticipated trips of the year. By mid-April, summer is already knocking on the door in South Georgia and the spring-fed waters of the Flint River near Newton, Georgia are a welcome respite from the heat. We don’t always flip our boats, but when we do, we’re glad it’s on the lower Flint. As usual, home for the weekend was the wonderful riverside Rocky Bend Retreat in Baker County. Guests enjoyed camping, riverside cabins and home cooked meals from Georgia Conservancy member and talented cook, Chuck Winchester. 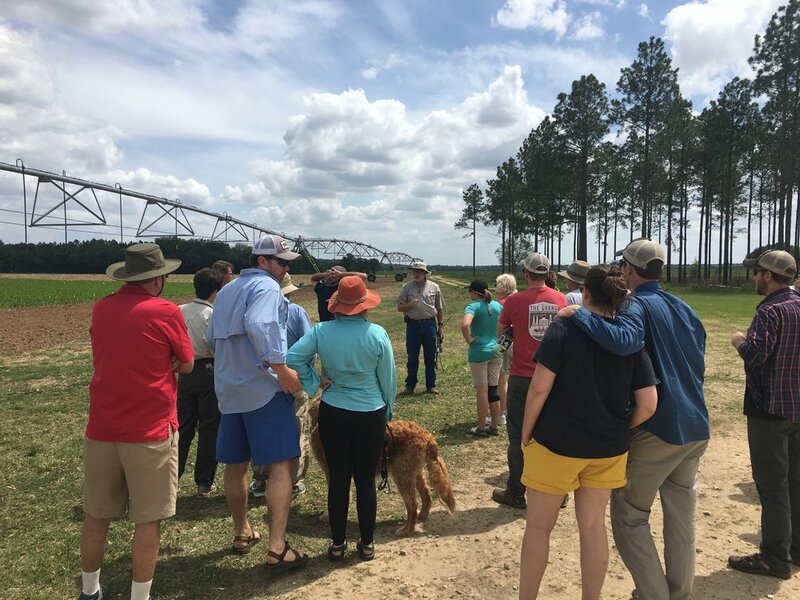 New to the trip this year was an educational tour and discussion of large-scale farming in Southwest Georgia – specifically as it relates to irrigation and water conservation. The lower Flint River Basin is one of the most agriculturally productive regions in the country. Known world-wide for peanuts, peaches and pecans, the fertile fields of southwest Georgia also produce blueberries, cotton, corn, soybeans and dozens of other crops. Without water, the Flint Basin and the greater Apalachicola-Chattahoochee-Flint (ACF) basin is also ground zero for what has been termed the Georgia-Alabama-Florida “Water Wars” – a longstanding battle over water rights and consumption. After an 8-mile paddle on Saturday, paddlers enjoyed lunch at Covey Rise Plantation and were joined by Covey Rise owner and operator, Robin Singletary, to learn more about how farms in this region utilize the Flint River, as well as the Floridan and Claiborne aquifers to meet their water needs, and how they are increasingly taking advantage of new advances in water conservation. Water conservation is not only important in keeping the Flint flowing and our aquifers full, but it’s also critical to the bottom line of many farmers in the region. Strategically located in the heart of Georgia’s bread basket on the Dougherty Plain between Newton and Camilla is the University of Georgia’s Stripling Irrigation Research Park. It is here that paddlers learned from Charles Stripling and Dr. more about how UGA is utilizing cutting edge research and technology to provide not only Georgia, but with world with the resources necessary to sustainably use our water resources in agriculture. Research and technology that focuses on variable rate irrigation, low pressure sprinkler retrofits, conservation tillage, advanced irrigation scheduling, remote soil moisture monitoring, water balance methods and more is being put to use by a number of farmers in the Flint River basin. We rounded out the weekend with a beautiful Easter Sunday paddle from Covey Rise to a landing just down river of Ichawaynochaway Creek. Special thanks to Covey Rise Plantation, Robin Singletary, Murray Campbell, Stripling Irrigation Research Park, Charles Stripling and Calvin Perry. Also, thanks to Scott Taylor of Three Rivers Outdoors, Chuck Winchester, Rocky Bend Flint River Retreat, Sweet Grass Dairy, SweetWater Brewing Company, Cafe Campesino Roastery, Rheos and ASW Distillery.